GARNER--Debbie Dunn has long felt the pull of the stage, from her first dose of Loretta Lynn's big-haired twang to her pageant queen days to her years heading her own country band. But her work behind the stage has also earned applause. For more than a decade, Dunn helped amateur performers shine - buffing the rough edges off of acts that often were more at home at a pig pickin' than underneath the bright stage lights of Johnston Community College's Country Music Showcase. 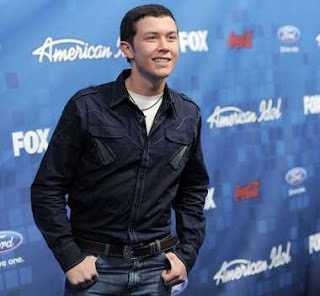 One of those acts, "American Idol" winner Scotty McCreery, was 15 when he auditioned for the showcase. Two years later, Dunn also managed the stage for his homecoming concert - a mammoth event that now is part of an Emmy-nominated "American Idol" segment. For Dunn, Scotty's transformation from a shy kid with a guitar to a full-blown star only proves her long-held beliefs about performing - that it has immense power and that it requires hard work. "I just believe in the performing arts and how it changes lives," said Dunn, who also worked with Raleigh's Clay Aiken, another North Carolina native and showcase veteran who was a runner-up in the Fox television competition. "I just couldn't be happier, really, than (when) helping people like Scotty." Judy McCreery, Scotty's mother, said his experience at the showcase turned out to be important training. The 1,000-seat JCC auditorium was the biggest venue he had sung at up to that point, and Dunn's rigorous training would preview his "Idol" rehearsals. "It was just a great foundation for Scotty," said McCreery, who spoke by phone from the "American Idol" tour bus on the way from New Orleans to Orlando, Fla. "Debbie gave Scotty an excellent taste of what it would take to be a professional country music singer." Scotty's "Idol" run has been a thrill for Dunn, who saw him perform live during one taping in Los Angeles, and, by a strange stroke of luck, played a key role in arranging his homecoming concert. Dunn had just started her new job in Garner when it became clear that Scotty would likely make the top three "Idol" contestants, all of whom would perform in their hometowns. The concert was a major logistical challenge for Garner, which welcomed a crowd of 30,000 - roughly the town's population - to Lake Benson Park. Dunn was quickly charged with managing the stage show, which involved details ranging from bringing in a stage to hiding Josh Turner's tour bus so that his appearance could remain a surprise. Dunn enlisted the Country Music Showcase band to accompany Scotty, which impressed Judy McCreery, who noted that many other "Idol" contestants sang to pre-recorded music at their homecomings. "She just took the whole music part and ran with it," McCreery said. "I don't know how many hours she put into it, but when we saw that stage, my mouth about dropped. I'll never forget it." This article was taken from newsobserver.com. Posted here are the parts mentioning Scotty but if you would like to read the whole article, the link is below. 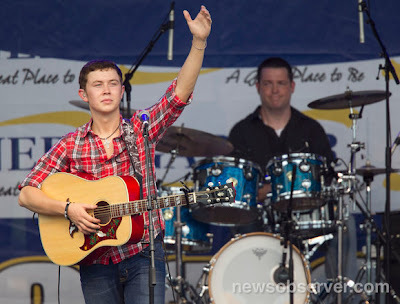 Tonight's an important one for Scotty McCreery. He's not only performing for the 12,000 or people who bought tickets to the show, but he's also showing members of the country music industry and media how well he can hold a crowd. They're listening to how he sings, they're seeing what kind of presence he has, they're gauging his performance and his potential in a room where they've watched the biggest singers in the genre, from Garth Brooks to Taylor Swift. For better or worse, he'll have a reputation in the country music industry after tonight, and it'll be a hard one to shake. The significance of the show wasn't lost on Scotty this afternoon as he did a round of interviews. Make no mistake: This is Scotty's audience. The people in the crowd may like other performers, they might cheer and scream for them, but the 17-year-old from North Carolina's the one that got them to the box office. And he doesn't disappoint. The crowd is with him for every word, every gesture. "What's going on, Music City?" he says after Are You Gonna Kiss Me or Not? "Y'all were probably wondering if I was ever going to make it out here," he says, noting that he's been watching the show from beneath the bleachers the whole time. Some of the audience sits for Scotty's single, I Love You This Big, but the rests between the lines are punctuated with the shouts of young girls. Scotty sounds like he's growing into the song, too. he hasn't always been spot-on singing this song, but this performance is one of the stronger ones I've heard from him. I am away till Monday, A very generous lady named Donna has offered to help out here, and I am just so thankful to you!! Have a great Sunday all.